An berree kumfee it iz 2! Thx AP! Yep, iz gud 2 see teh donkee! 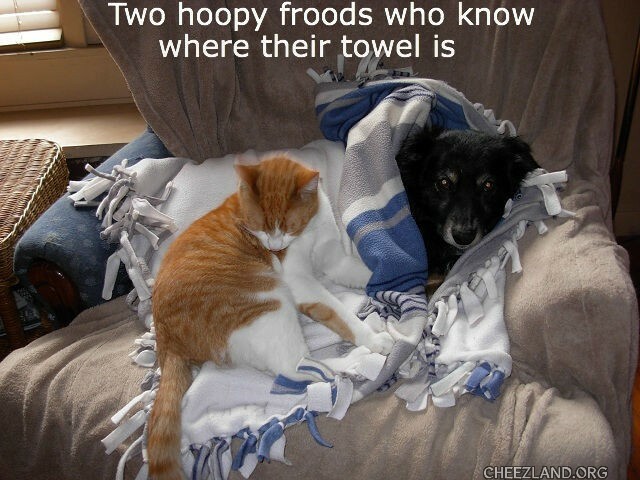 I don’t needs a towel, I gots a kitteh! Whut if teh kitteh needz a towlol? So, duz u knoz ennywun hedded owt Altayr way? Yewr nawt Sirius, ar yew? Otay den, enny semi-regulus kynda star. Ai cood hed owt dat way, ‘cept ai mite get pulled ober by a Polaris car. Dats nawt teh Sol reezun, ai suspeks. Aifink Ai nead a rifresher – hab reedid dem sebrul tiems, seed the TV bershun an heered teh raydeeoh, but hab fergottid a lawt! Duz Marvin ware himz sunglassiz at nyt? Great. Sumfing else tew bii depressed abowt. I hazza happeetayl! Noo Mithy kaymded hoam frum the Hyoomain Sewsyittee 2dai!!1! Herz hazza noo furebber hoam wif us nao! yea! thangs fore shaering teh happie news, alwais gives me a grate feeling! Hip Hip Hurray for Mithy’s gnu furreber hoam!!!!1!!1elbenty!!!!!! Yay fur furebber hoam an happinesses an lubs!!!!!! yea for kitteh getting a forebber hoam!! she will be soooo grateful and hapeh..it’s only later on she’ll turn you into minyunz–but ai downt think you’ll mynd! Gib her a pat for me. this pitcher waz takin as Tess waz recobering frum a ‘mergencie baff. she rolloled in bear poops. oh teh smell manatee! Thay don’t just goe inna wuds, thay goe inn mai yard! Geddoff mai yard! Tehr am nuffing rong wiff yr pyooter. Du nawt attempt tu adjusting teh messidjes. We ar controllifying transmission. Iffen we am wishing tu making it louder, we will bringing up teh bolyoom. Iffen we wishing tu make it softer, we will toon it tu a wisper. We am controling teh horryzontlol. We will control teh berticlol. We can roll teh image, make it flutterby. We kin changify teh foke cus tu a sawft blur or sharpify it to crystal cleerity. Fore teh next our, sitting kwietly an we will control awl dat yu seeing and heer. We repeet: tehre am nuffing wrong wiff yur pyooter. Yu am about tu partissypate in a grate adbencher. Yu am about tu experiencing teh aw and misstery which reechiz frum teh inner braynium tu — Teh Owter Limitz. Still…it’s not a naturally tenable position. Ahhh! Woooh! What’s happening? Who am I? Why am I here? What’s my purpose in life? What do I mean by who am I? And…we have a weiner! Congrats Aahz. Johnny, tell ’em wut hee’z wun. Thanks, bob–this littlol kitteh will hab plenty ob fud tu eat when a double 18-wheeler comes up to your door with elebenty nine cans ob salmon! aw c’mon, we’ll help u load it into the garage and enee spare bedrums yu hab! Grate!! Jess in thyme 4 teh noo kitteh!! Dingdingding…teh…er…lite bulb… in teh shaydz winz teh pryze…..
Awf tu tayk teh Henry-boi fur him’z berry furst gruuming. Mai hubcat, Steve, sez weel get a cawl fibe minnits after we getting hoam tu come an get him. Snerk.